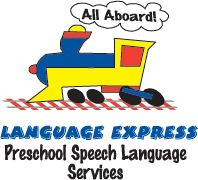 Please take a moment to provide feedback about your experience with the Language Express Preschool Speech and Language Program. This survey will take approximately 5 minutes to complete. All feedback is anonymous, meaning you will not be personally identified. The feedback will be grouped together in an overall report. This information will be used by Language Express staff to improve programs and services. Your decision to participate or not participate in this survey will not affect the service that you receive from Language Express. Please indicate if you agree or disagree with the following statements. My child’s communication skills have improved since working with Language Express. Information and suggestions given to me by Language Express were clearly explained and realistic. I have changed the way I talk and play with my child as a result of the recommendations made by Language Express. I feel confident in helping my child with his/her speech and language. My child’s reports from Language Express were useful and easy to understand. It was easy to refer my child to Language Express. Do you feel that you were given useful information to help your child while you waited for your first appointment (i.e. on the phone and in the package that was mailed to you)? What else would you have liked to receive?